The beacon on Mt. Diablo will be lit by and in honor of Pearl Harbor survivors on December 7. 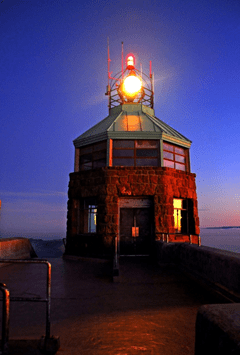 On Monday, December 7th, Mount Diablo's Beacon will be relit by survivors of Pearl Harbor. "The Beacon lighting is a tribute to those individuals that lost their lives at Pearl Harbor", says Earl "Chuck" Kohler, one of the few remaining survivors in Contra Costa County. However, the ceremony is also an opportunity to honor the survivors. When those who experienced Pearl Harbor are gone, the history is lost with them. We invite you to attend the ceremony to pay tribute to and honor our veterans. The Sons & Daughters of Pearl Harbor Survivors, Chapter 5 are pleased to co-sponsor this 52nd Annual National Pearl Harbor Remembrance Day Ceremony with Save Mount Diablo. Presentations will be made by the few remaining local Pearl Harbor survivors, Mount Diablo State Park, David Behring (President of Wheelchair Foundation), as well as Save Mount Diablo. The Beacon on Mount Diablo was originally installed and illuminated in 1928 to aid in trans-continental aviation. It is one of the four guiding beacons installed along the west coast by Standard Oil of CA and is the only one known to still be operational. After the attack on Pearl Harbor, the Beacon's light was extinguished during the West Coast Blackout, for fear it may enable an attack on California. It stayed dark until Pearl Harbor Day 1964, when Fleet Admiral Chester Nimitz relit the Beacon in a commemorative ceremony and suggested it be illuminated every December 7th to honor those who served and sacrificed. Since that day, Pearl Harbor Veterans and their families have gathered every December 7th to see the Beacon light shine once again. The ceremony and lighting will be held at California State University, East Bay Campus, 4700 Ygnacio Valley Road, Concord, CA. The ceremony starts at 3:45 p.m.
Live feed from the summit of Mount Diablo to the ceremony will be provided by CCTV. For more information about the Beacon Lighting Ceremony, please visit our website.